Surprising as it sounds, war has made humanity safer and richer. In War! 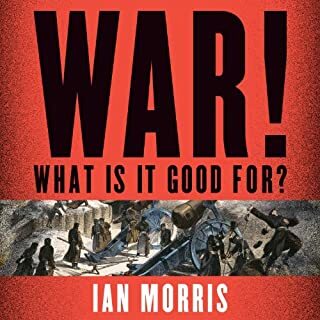 What Is It Good For?, the renowned historian and archaeologist Ian Morris tells the gruesome, gripping story of 15,000 years of war, going beyond the battles and brutality to reveal what war has really done to and for the world. War, and war alone, has created bigger, more complex societies, ruled by governments that have stamped out internal violence. Not What I Expected At All!!! Sometime around 1750, English entrepreneurs unleashed the astounding energies of steam and coal, and the world was forever changed. The emergence of factories, railroads, and gunboats propelled the West’s rise to power in the nineteenth century, and the development of computers and nuclear weapons in the 20th century secured its global supremacy. Now, at the beginning of the 21st century, many worry that the emerging economic power of China and India spells the end of the West as a superpower. In order to understand this possibility, we need to look back in time. Why has the West dominated the globe for the past 200 years, and will its power last? Describing the patterns of human history, the archaeologist and historian Ian Morris offers surprising new answers to both questions. It is not, he reveals, differences of race or culture, or even the strivings of great individuals that explain Western dominance. It is the effects of geography on the everyday efforts of ordinary people as they deal with crises of resources, disease, migration, and climate. As geography and human ingenuity continue to interact, the world will change in astonishing ways, transforming Western rule in the process. Deeply researched and brilliantly argued, Why the West Rules - for Now spans 50,000 years of history and offers fresh insights on nearly every page. The book brings together the latest findings across disciplines - from ancient history to neuroscience - not only to explain why the West came to rule the world but also to predict what the future will bring in the next hundred years. Can Central Banks Goose Growth? I was so impressed with Ian Morris' viewpoint and breadth that I purchased the hardcopy to re-read and share with friends. As the cover says, this is possibly the closest we'll ever come to a grand unified theory of history. Even more enjoyable if you're familiar with the basics of complexity theory as his arguments (seemingly unintentionally) flow very much along those lines. 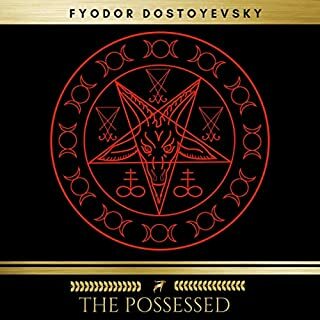 The only quibble - and this is a minor one - is that there is significant discussion of various diagrams throughout the book This of course doesn't come across in the audio-format however they are generally explained well enough to be not completely lost. After an extensive first third of the book dealing with prehistory to dispel any still possible existing claims of racial superiority between East and West, the book becomes mainly a comparative history between "East" and "West". Of course this description does not do full justice to the scope and ambition of the author, whose main theory is that progress in history is a product of geography and social development, with one feeding on each other, creating both splendor and collapse; he comes up with an index to measure civilizational development and concludes that there is no foundation for one culture claiming superiority over another. Mr. Morris wildly overreaches in staking a claim for geography as the main driver of history: he concludes that great men, and culture in general, have played no crucial part in civilization, and that history would have taken pretty much the same course whatever these men or women did: would really history have been the same without Napoleon, George Washington or Isaac Newton? This gives his theory a sometimes disturbingly materialistic and deterministic bent. His definitions of East and West are highly debatable: since for him culture is not important, he does not make a difference of the split between Christianity and Islam, and sees both as part of the West; obviously, he does not make a big deal of the subsequent schism between Catholics and Protestants. Just look at the huge differences between Europe and the Arab World, or the US and Latin America and the claim that these divergences have not had a major role in shaping history seem wildly unrealistic, . That said, Mr. Morris is a compelling narrator, and in some cases his arguments are definitely persuasive. 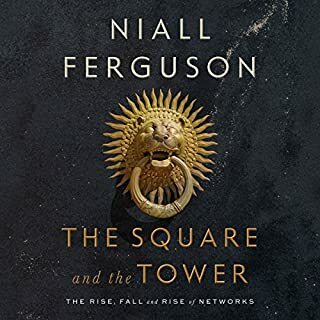 The close attention he gives to both the rise of the East and the West provide a much needed balance to existing world histories, and shed light on the interconnectedness of the World starting in Antiquity. His final thoughts are quite dazzling. Well worth a listen. Is this book worth the time? 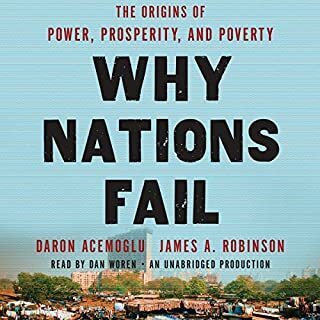 The basic premise of this book is that economic and physical geography (mostly economic) determine economic development and that economic development at any period of time determines whether the east or west rules. Morris develops an "/social development index" which he then applies to the east and west for every period of human history from prehistoric to modern times. The strength of the book is its in depth summaries of the stages of human history going back 250,000 to the first members of the Homo genus and forward to 70,000 years ago and the first modern humans (Homo Sapiens). He then goes through a rather detailed analysis of every era until roughly 2010 CE. 1. The author points the audiobook listener to exhibits on his website that are included in the printed book, but the exhibits are no longer on his website. I bought the printed version of the book in addition to the Audible version in order to understand the exhibits. This method of using an audiobook plus a website for exhibits can be quite effective. There are several examples including Jonathan Haidt's The Righteous Mind and Donald Rumsfeld autobiography that are marvelously effective using this technique. 2. There is a long standing trend in the social sciences to attempt to quantify that which cannot be quantified. Morris takes this to the point of idiocy with his "social development index" He readily admits that his indices may be off by 10% or even 20% and then claims that the west was better off in 100 BCE than in 1500 BE despite there being less than a 20% difference in his indices for the period. 3. Morris' definition of east and west varies greatly with time. For example, the definition of "the west" moves from the Middle East during most of human history to Europe and then to the US. Morris' basic premise that neither the west nor east is guaranteed leadership and that while the west now "rules" the movement is toward the east which will likely take the lead in less than a century is definitely valid. I also buy into his claim that economic geography is a large portion of the determinant of leadership. However, he minimizes the importance of military power and the willingness to use it as a/the major factor in determining whether the east of the west leads. This is ironic since his recitation of the history of various periods shows that possession of military power with the willingness to use it always determines the leader. As a brief but concise history of Homo Sapiens I would give "Why the West Leads-for Now" five stars. As a social science book about the ebb and flow of east vs.west leadership, which it claims to be, the book deserves 2 stars. Its "social development index" gets in the way of a well argued position. 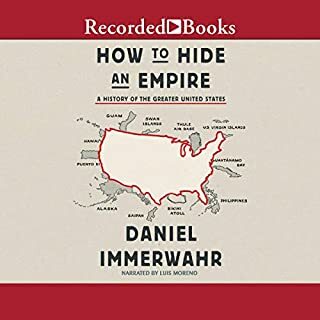 This is one of those audiobooks that will leave you thinking, and probably irritating your friends with little historical anecdotes and observations. Like the other reviewers, I was bothered by aubible's failure to provide the book's figures as a pdf download. You can get Morris' central chart of societal development from his webpage though. 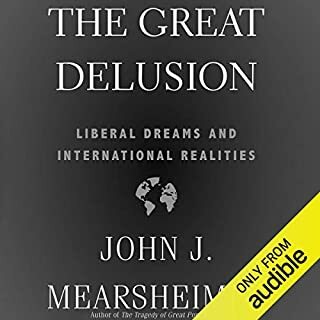 There's a lot to quibble about in this book, and his predictions for the future at the end get downright bizarre, but the book is a truly admirable summary of both eastern and western history, and a worthy heir to Guns Germs and Steel, picking up where Jared Diamond leaves off: explaining why Europe ultimately beat China. I think Morris could have been clearer and more explicit in places (emphasizing in the introduction, for example, the central role he'll later claim that firearms played in facilitating Europe's rise from about the 15th century on), I think the particular methodology he uses to construct his social development index is faulty and using the underlying energy capture index alone is probably more revealing, and the book is just plain too long; nevertheless, it's well worth reading and I highly recommend it. I loved the way Ian goes back to the very begining of man - Out of Africa. It was very informative to me to get this broad persopective on the evolution of our race and our society. And he makes a very compelling argument for what the next 100 years will bring. Loved the last chapter. If you could sum up Why the West Rules - for Now in three words, what would they be? Would you recommend Why the West Rules - for Now to your friends? Why or why not? depends on the friend...parts of the book are heavily dependent on references to charts and graphs which obviously are not available through listening, though available on his web site. I'm interested enough in the subject to listen through this, but parts are a real slog. Other parts do work well, illuminate the subject, and even are dryly humorous. I really enjoyed Ian Morris' book, War! What Is It Good For? : Conflict and the Progress of Civilization from Primates to Robots, highly recommend that. Morris is a Stanford professor, a Cambridge University PhD, and the author of 10 books and "more than 80 articles on archaeology and history." He is a guy who gets his hands dirty, leading digs in places like Monte Polizzo, Sicily - as well as a gifted writer. Should you invest the 24 hours and 41 minutes necessary to listen to this book? Yes if you often wonder "how did I get here," in the sense of owning all this crap, burning all this fuel etc. etc., while most of the world (at least the vast numbers of rural poor in Asia), today live quite different lives. Yes if you've ever argued out loud (or thought to yourself), that the reason we Westerners have so much crap and burn so much fuel was either an inevitable development due to geography, climate, species, disease patterns etc. (long-term lock-in), or the result of actions and decisions by both great and incompetent historical actors (short-term accident). Yes if you wonder why social development in the Eastern world (as measured by energy capture, information exchange, war making capacity, and city size) outstripped the Western world from the 1,000 years between 600 CE and 1600 CE, only to fall radically behind the West by 2000. Yes if you think it is important to take the really long view, from the beginning of agriculture (8,000 to 5,000 BCE), rather than starting the story at the beginning of the industrial revolution in late 18th century England. Yes if you have the sense that real story of the 21st century will happen in Asia, and that if we want to be working where the big changes in higher ed will be occurring we better be prepared to work in East or South Asia.â€¨â€¨Yes if you love history, sociology, archeology, and economics - and like books that integrate theories, ideas and facts from across the disciplines. A history lesson that we all should be aware of. 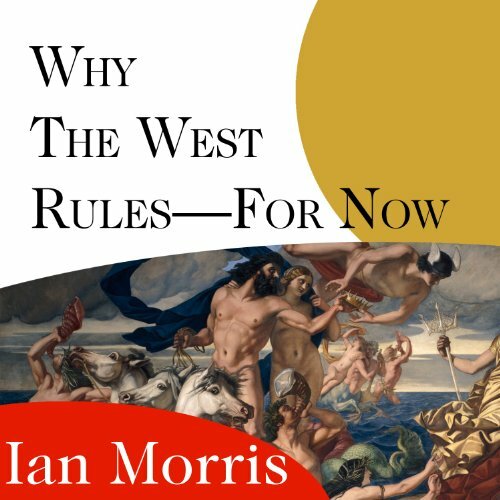 Would you consider the audio edition of Why the West Rules - for Now to be better than the print version? I like audio because it provides the flexibility to "read" on the go.Dr. Morris uses a multidisciplinary approach to analyze the history of man from the last major ice age 20K years ago to today. And he fills in the banks illustrating how vulnerable mankind has been and is to physical geography and climate change magnified by migration, famine, epidemic and state failure. He shows what was to me, and I think most others, how our education leaves huge gaps during which these forces have negatively impacted human history countless times, just as they Probably will again in regard to who, if anyone, will rule the future. He unfolds in depth detail numerous insights into aspects of history that I was surprised to find out that I did not know. Great read for people who want to know the real story and it's context. No PDF for often referred illustrations, charts and tables. What was most disappointing about Ian Morris’s story? Only addresses two parts of the world. incomplete. There is more to human development than what occurred in Europe and east Asia . What about the Americas and sub Saharan Africa ? Other than that it was well reasoned and entertaining .